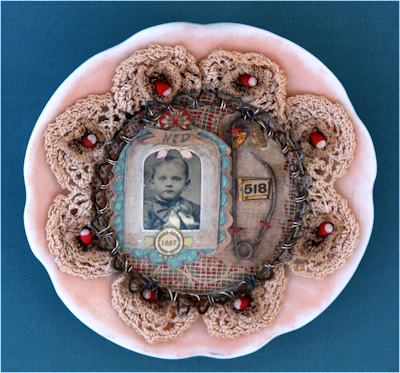 Moments after I blogged about the disorder pica and the Chevalier Jackson Collection of swallowed objects at the Mütter Museum in Philadelphia (2,000 ingested items organized in shallow drawers), I was contacted by follower Lisa Wood, a gifted artist who collaged a series of plates based on the case histories keyed to that very collection (for instance, 17-month-old Ned Mumford, who swallowed a safety pin, 1st image). Not only that, her friend was writing a book on the same subject! The book - Swallow: Foreign Bodies, Their Ingestion, Inspiration, and the Curious Doctor Who Extracted Them by Mary Cappello - has since been published. I reviewed it and found it fascinating. 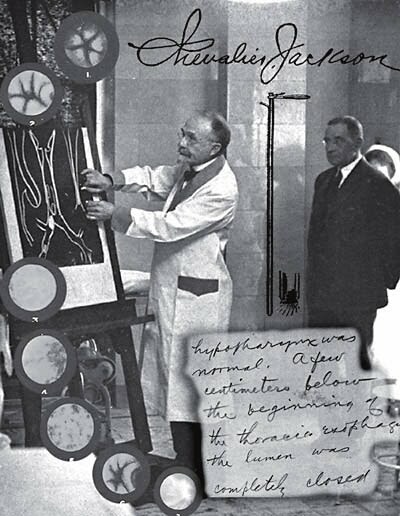 The doctor in question is American laryngologist Chevalier (or as one young patient remembered him decades later, "Chevrolet") Jackson (2nd image), and curious he was. Curious, too, were 2 coincidences that occurred to me while preparing the review. 1st) I mentioned what I was doing to my Mom and she had just read the passage in the novel Freedom in which one of the characters accidentally swallows his wedding ring, and 2nd) I sent a copy of the unpublished review to my nonagenarian friend Anne and she called to tell me that in 1943, her 9-month son contracted pneumonia and in an attempt to save him (which they were unfortunately unable to do), the Philadelphia doctor was among the first to use a tracheal tube designed by Dr. Jackson (3rd image) on an infant! She said she could never forget that name. A 52-year-old Dutch woman named Margaret Daalman sought medical attention for a stomach ache. 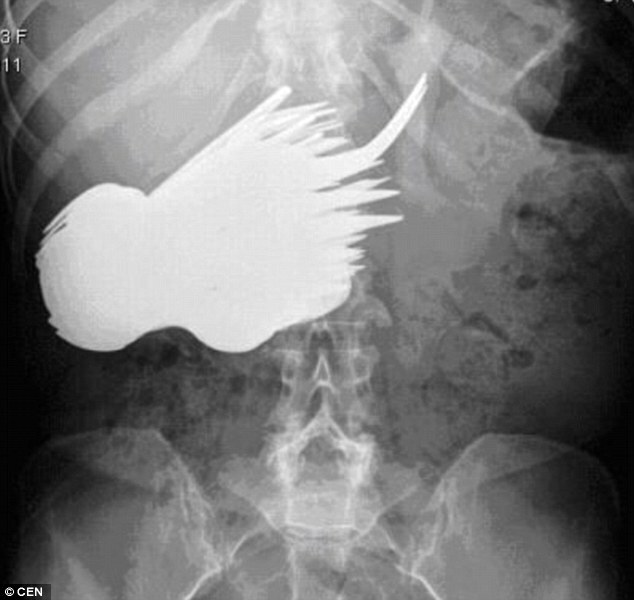 When her X-ray (4th image) showed 78 different items of cutlery inside, she was rushed into surgery. "She seems to have been suffering from some sort of obsession and every time she sat down for a meal she would ignore the food and eat the cutlery," said one medic. After the removal of dozens of forks and spoons (no knives), Daalman made a full recovery - again. It was not the 1st time she had been treated for eating the silverware....This 30-year-old case of pica came to light in 2009. At the time, the doctors in Rotterdam said they had never heard of anyone consuming as many foreign objects. "I don't know why but I felt an urge to eat the silverware - I could not help myself."